to read, write, and calculate! The Literacy Action Center, a nonprofit 501(c)(3) organization since February 1985, transforms English-speaking adults, who enter our program with limited reading, writing, or math skills, into skilled, passionate, habitual, critical readers, writers, and mathematicians! We specialize in English-speaking adults whose reading, writing, or math skills are below a fifth grade level and live in Salt Lake County or Davis County in Utah, USA. Our instruction is delivered in two ways: small group instruction by paid professionals and a core of volunteers with expertise and passions in specific areas and one-on-one tutoring by trained volunteers. Why both? These adults need the advantages that come with both delivery methods; each method provides program elements that the other method cannot provide. 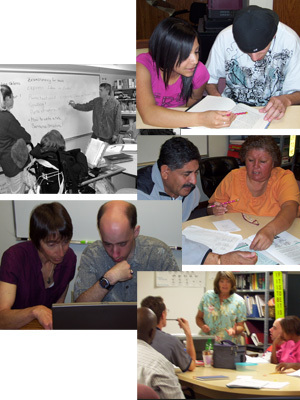 We educate community volunteers to deliver one-on-one instruction and support small group instruction. Find out more about Volunteer Opportunities. We are not state funded. We are funded by people like you. Find out How You Can Help support adult literacy instruction. Please note: The adults who need our help can�t read this web site. If you know someone living in our area who needs our help, please tell them about us. Find out more about becoming an Adult Learner.